In the creative process of drawing a sketch mental additions are first tested internally then externalized to the paper; the information is distributed, some is held on the paper and some is held as a mental image. Today, most serious cognitive work is done with computer tools, not paper which makes it even more interactive and distributed, some of the action occurring in the brain, and some in the computer. In this talk I will introduce visual thinking algorithms as a way of describing the dialogue between humans and computers involved in visual thinking. These algorithms are described using simple pseudo-code and are intended to support design decisions regarding which visualization methods to use. Key components of visual thinking algorithms are visual queries and epistemic actions. Visual queries are aspects of a problem that have been transformed so progress towards a solution can be accomplished by means of a visual pattern search. Visual queries are constrained by visual pattern perception, as well as visual working memory capacity. Epistemic actions are activities, like eye movements, or mouse selections designed to gain more information. Examples of visual thinking will be given, including design sketching, generalized fisheye views and reasoning with a social network diagram. Short Bio: Colin Ware is the Director of the Data Visualization Research Lab which is part of the Center for Coastal and Ocean Mapping at the University of New Hampshire. Ware specializes in advanced data visualization and has a special interest in applications of visualization to Ocean Mapping. He combines interests in both basic and applied research and he has advanced degrees in both computer science (MMath, Waterloo) and in the psychology of perception (PhD,Toronto). Ware has published over 140 articles in scientific and technical journals and leading conference proceedings. Many of these articles relate to the use of color, texture, motion and 3D displays in information visualization. His approach is always to combine theory with practice and his publications range from rigorously scientific contributions to the Journal of Physiology and Vision Research to applications-oriented articles in ACM Transactions on Graphics and leading visualization journals. Ware also likes to build useful visualization systems. The Fledermaus visualization software, widely used in ocean mapping applications was initially developed by him and a team of graduate students. 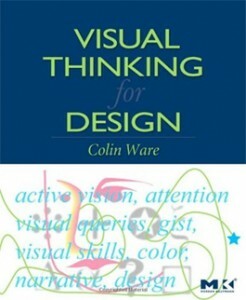 Colin Ware’s latest book, Visual Thinking for Design is an up to date account of the psychology of how we think using graphic displays as tools. This follows his previous book Information Visualization: Perception for Design 2004 2nd Edition (3rd edition to appear shortly).